GOLLUM GOLLUM...*ahem* I mean PEETA. Poor Peeta is so confused by his memories he's started arguing with himself like Smeagol from Lord Of The Rings. Chapter 17 opens up to Katniss finding out that according to District 13, her part in the fight against The Capitol is over. She is furious that she will not be able to join Gale and the other soldiers in the fight on the front lines. In order to be able to join the soldiers, Katniss is given the opportunity to join them in training to get into fighting form in time to attack. Katniss gets Johanna to join her in training so they will both be able to go. I don't necessarily think that this will make it in the movie as more than a tiny part but if the movies were a little more silly this would be a perfect place for a montage. Katniss and Johanna working out. Johanna freaking out over the rain. Throwing up their stew whilst doing jumping jacks. You know, normal training footage, showing us a passage of time. Lots of things happening at once, reminding everyone of what's going on, with every shot show a little improvement because to show it all would take too long. THAT'S CALLED A MONTAAAAGE. EVEN ROCKY HAD A MONTAGE. And of course you gotta fade out in a montage. At some point during this training montage, Johanna and Katniss have decided to bunk together. They go to get dinner with their friends and low and behold who shows up but crazy himself, Peeta. He proceeds to make some off color remarks about Annie and Katniss and Katniss decides to leave. Johanna later tells her that when she left Peeta starts to argue with himself as if he was two people. They quiz each other on military tactics and as they go to sleep, Katniss gathers the courage to ask Johanna about being tortured in The Capitol with Peeta. Johanna confirms that they were very familiar with each other's screams. Neither girl has a peaceful night. I really hope that this conversation between Johanna and Katniss happens. 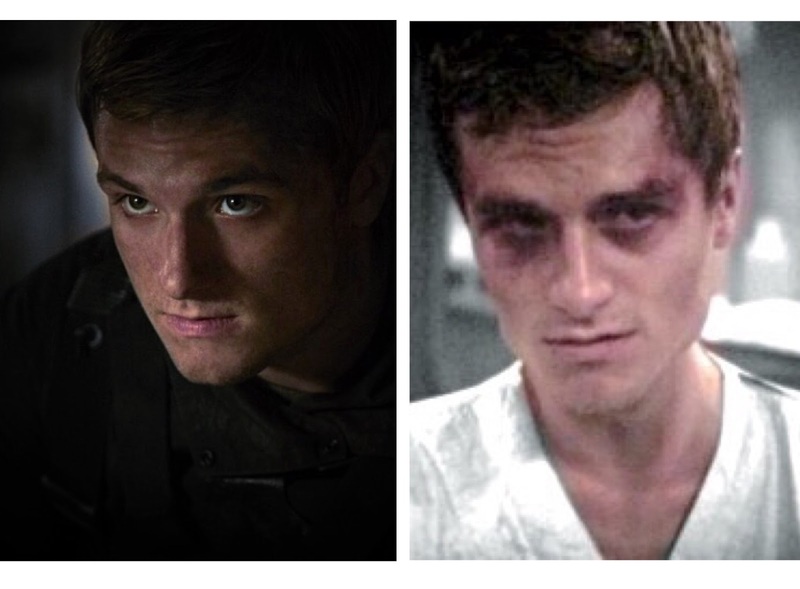 We get a glimpse of what was done to Peeta and Johanna and we see how truly broken Peeta's memory is. Mockingjay has launched a new website squad451.thehungergames.movie and it's pretty cool! 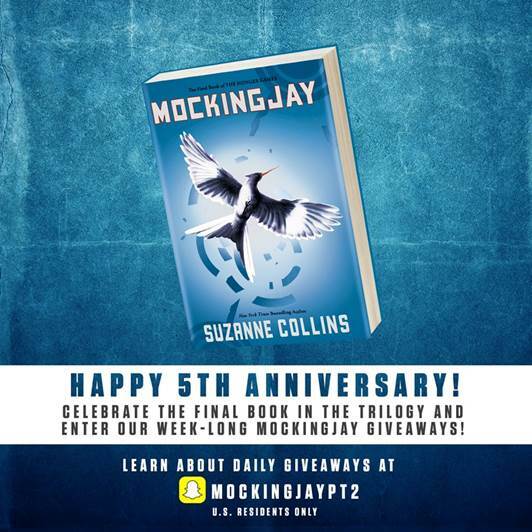 Mockingjay 5th Anniversary Snapchat Giveaways! Follow Mockingjaypt2 on Snapchat and send them a snap of you with your copy of Mockingjay and you can win the gift of Mockingjay for a friend! Make sure you check out their stories every day all week to see if there are any new announcements! Chapter 16 begins with Katniss waking up in the hospital in Distirct 13 from a Morphling-induced nightmare after she's been shot in District 2. She is wakes up when dream Peeta says, "Always." If this dream sounds familiar to you, it's because it already happened in Mockingjay Part 1. Since it seems like they borrowed that scene from this chapter, it's highly unlikely it'll be repeated in this movie, but then again you never know. Instead of that scene, it would be interesting to see something that Katniss wasn't present for: the discussion that the commanding officers in District 13 had about the incident and how they can take advantage of it (they shoot propos of Katniss in her hospital bed showing off her scars later on in the chapter). This would be a great opportunity for the movie to introduce President Coin's more conniving side. It's possible she doesn't see what happened to Katniss as a bad thing, and that maybe gives her ideas later on that affect some of her more drastic choices involving Katniss and what she's willing to do to secure her position of power once the rebels gain control of the Capitol. We see Johanna Mason for the first time in a while after Katniss wakes up and after a conversation with her and another one with Gale afterwards, the next scene in the book is Katniss talking to Plutarch Heavensbee. He explains to her that since the rebels have taken District 2, the Capitol is now cut off from the rest of the country and because they were more focused on their overly luxurious lifestyles (Panem et Circenses - Bread and Circuses), they cannot afford to sustain themselves from much longer. In the meantime, the rebellion is taking time to regroup and film a pretty big propo - Finnick and Annie's wedding. We don't know if Philip Seymour Hoffman was around for this scene. 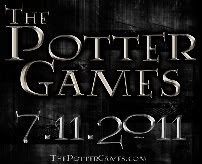 Hopefully he was but if he isn't, Katniss will most likely have the conversation with Haymitch (or Finnick or Boggs). It's also possible that Effie will be present for the latter part of the conversation for the wedding and to maybe explain the Capitol lifestyle since she's one of the few people in District 13 who is originally from the Capitol. Speaking of the wedding and Effie, I'm really excited to see her there for the prep and the wedding itself. The wedding is the happiest thing that happens in the book and as we've seen, Effie certainly brings a certain degree of levity to the scenes she's in. I hope she says one of my favorite lines from the book- "It's been so long since I've seen anything pretty" - originally said by Octavia. 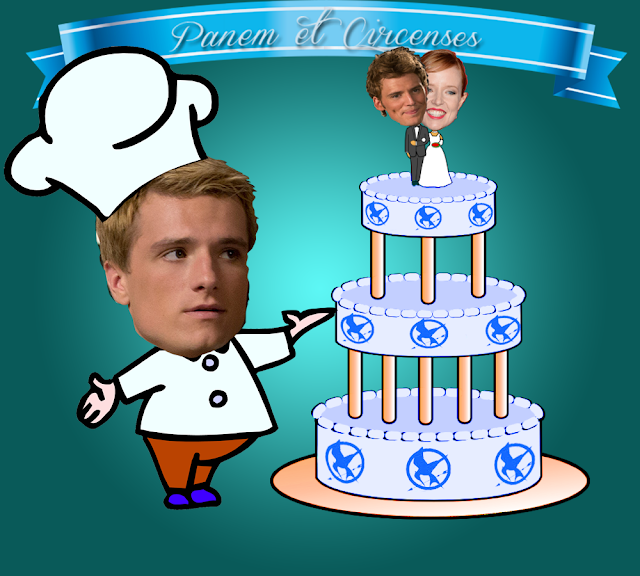 In case you couldn't tell above, I'm really excited to see Annie and Finnick's wedding cake that Peeta had decorated. I'm also hoping we get to see him work on it. Katniss has not seen Peeta since he was very unstable and by the time she sees him again later on in the chapter, he seems calmer and more well-adjusted. At least well-adjusted enough to intricately frost a wedding cake "under heavy guard," as Haymitch put it in the book, so it would be interesting to see how he got to that point, maybe working with Delly Cartwright or whoever is filling her role. Of course since the happiest thing in the book happens in this chapter, it is immediately followed by one of the more heartbreaking scenes in my opinion. Katniss realizes that any illusions Peeta had about her before he was captured and tortured by the Capitol has been destroyed. He's done putting her on a pedestal and that upsets her. Even more upsetting to me personally is Peeta remembering the story about the bread on his own, even the dandelion. Then he says another one of my favorite lines from the book that 98% of me is sure is going to make it into the movie (the other 2% is hoping and praying tbh)- "I must have loved you a lot." FEELS. The beginning of the end of Katniss and Gale's relationship, where Gale's suggestion to trap the citizens of District 2 in the Nut and force them to either die or surrender. Katniss is reminded of her father's death and this moment heavily foreshadows Prim's untimely end. I'm hoping that this is the turning point in Gale's destructive arc. So far he's been a very sympathetic character and his bloodthirsty attitude towards the Capitol has been downplayed. Katniss' horror at his suggestion is shared with others, though his suggestion is agreed upon. I'm excited to see the avalanche and destruction shown onscreen. We've had glimpses of huge destruction in the trailer which will look amazing! I also hope we will have some sort of flashback to Katniss' fathers death and how similar it is to the people who will die in the Nut. While they are executing the destruction, Haymitch relays to Katniss the effort to break Peeta out of his hijacked brain by playing "The Hanging Tree". It is the first time he responds to a video of Katniss without anger, because it had not been played for him. Peeta is reminded of Katniss' father singing the song, which is the second time we are reminded of her father, so fingers crossed. This then leads to a huge moment in the book which will most definitely show up in the movie as they ask Katniss to make a speech to the injured folk who have escaped the Nut to join her against The Capitol. When she asks them to join her, Katniss ends up watching herself get shot by an unknown assailant in the crowd as we so beautifully reenacted. And we’re back with another chapter of Mockingjay in our countdown. In this chapter, Katniss describes District 2 as a combination quarry/Capitol military base. 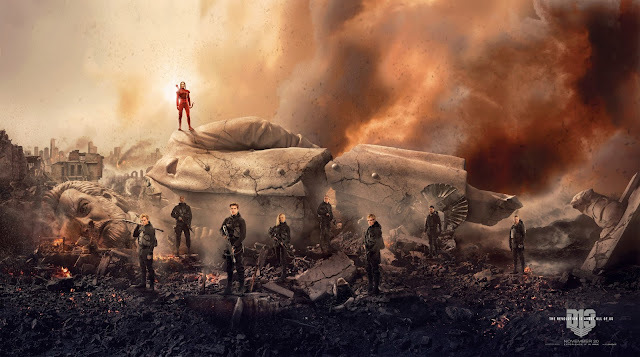 Because the Capitol’s Peacekeepers and military resources come from 2, the District is thought to be spoiled relative to the other districts, making them the toughest holdouts to the resistance. However, the rebellion resonated with the stonecutters and miners. The center of the District, nicknamed the “Nut”, is a military base cut into a mountain, and the rebels are challenged with how to take it. At this point, Katniss has been in District 2 for two weeks. She gets a sense of freedom there, being away from the restrictions of District 13. She explains that she is often moved from place to place to keep her safe, and she provides some of the game she has hunted to her host family as incentive to house her. She also reflects on Peeta’s situation. Katniss is in communication with Plutarch and Haymitch back in 13 who give her reports on Peeta’s progress. Throughout the chapter, it’s clear she’s lost hope that she’ll ever see the Peeta she knows again. 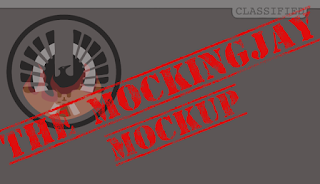 It’s unclear whether or not Haymitch and/or Plutarch will stay behind in the movie, since it’s possible that Prim could be the one to update Katniss on Peeta’s progress. Beetee and Gale soon join Katniss in District 2, as part of a team to strategize on how the rebels could take the Nut. Gale and Katniss talk and make out for a bit, and Gale explains when he started to have feelings for her. It’s unlikely the movie will have the same conversation since Darius isn’t in the movies, however a similar version may appear, mostly Gale’s comments on how with Peeta’s current state Katniss isn’t free to be with him. This chapter introduces Lyme, the commander in 2 and former Hunger Games victor, to be played by Gwendoline Christie. Though she’s a background character in the books, restricted to the District 2 chapters, it’s very likely that Lyme will have a bigger role in the movies. Here, Lyme expresses frustration with the failed attempts to take the Nut, but Gale, with Beetee’s support, offers a different perspective. Comparing taking the Nut to a wild dog den, Gale suggests using explosions to cause avalanches to block the entrances. Boggs points out that the plan risks killing everyone inside, and Katniss realizes that Gale doesn’t intend to keep the people inside alive with his plan. It’s very likely this scene will go down in the movie very similarly to in the book, if not expanded on in the movie. The description of Gale’s trap is key foreshadowing for the climax of the movie, so this scene is doubly important to include in the movie. We’re excited to see District 2 and especially looking forward to see how Lyme’s character will fit into the narrative.